According to police, they were called to the school to investigate allegations of a crime. As they were talking to the young girl, she allegedly became “uncooperative and then combative,” according to the release. While officers struggled to control the elementary student, one of their firearms somehow discharged while still in the holster and also somehow hit the girl, according to the release. After being shot, the girl was taken to a nearby hospital and treated for a graze wound and released. Milwaukee Police Department spokesperson, Sgt. Timothy Gauerke explained to the media Thursday afternoon that the officers’ Smith and Wesson M&P .40 pistols do not have external safeties. The officer whose firearm discharged is a 40-year-old man who has been on the department for 16 years, Gauerke said. The officer will not be placed on administrative duty because, conveniently, the incident is not considered an officer-involved shooting, but rather an unintentional discharge, according to Gauerke. While it is true that S&W M&P pistols do not have safeties, pulling the trigger while in the holster is all but impossible. As the Free Thought Project has reported in detail, police holsters are designed in such a way that only that officer can get the gun out and fire it. 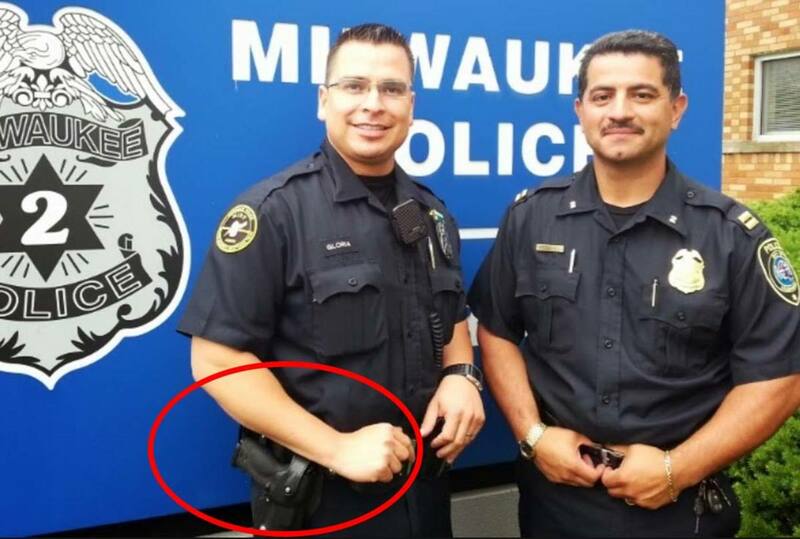 Milwaukee police employ the use of multiple-point retention holsters utilizing both the hood guard and a friction holster. The “hood,” or the strap that holds the weapon in the hard plastic holster must be pushed down from a particular angle and then pushed forward, prior to exposing the back of the weapon. During a struggle, it is entirely possible that the hood could have been pushed down, leaving the rear of the slide exposed. However, the hood guard adds another entirely new level of pistol retention as it is specially designed to prevent an assailant from pushing down the hood. Even if the hood guard was removed and the rear of the pistol exposed, the next line of retention in this holster does not allow for the pistol to be removed, nor the slide pulled back, without knowing exactly how to lift it out of the holster. This holster and holsters similar in design have a tension screw in place that allows for its users to set the desired level of friction needed to remove the pistol. However, if someone tries to pull the pistol out of the holster in any direction other than the officer’s set preference, the slide will not rack, nor will the pistol come out. Short of the nearly impossible scenario of the pistol firing by itself, in order for this officer’s gun to have fired, it would have had to have been removed from the holster — making the official account of what happened, questionable, at the very least.